There is a WAF National Pilgrimage to Fatima this summer. Fr Jason Jones, the WAF England and Wales Spiritual Director, is organising the 2019 pilgrimage. The dates are 10th-16th July. This pilgrimage will include the special ceremonies on the twelfth and thirteenth of the month, and includes return Flights to Lisbon, half-Board in Domus Pacis hotel, and all taxes & coach tours. For more details please visit the National Pilgrimage page. The World Apostolate of Fatima, (WAF), is an association present in many countries throughout the world which is open to all the baptized, and directed primarily to the laity. It seeks to make known and lived the very important message of peace and salvation for all mankind given by Our Lady of Fatima, though the young seers of Fatima, Lucia dos Santos, and Jacinta and Francisco Marto, and to explain why this message is so important. On 7 October 2005 its international statutes were approved ad experimentum by the Pontifical Council for the Laity, and on 7 October 2010 it was permanently erected as an international Public Association of the Faithful by Cardinal Rylko, President of the Pontifical Council for the Laity. This confirmed that the World Apostolate of Fatima is in full communion with the Holy See and that its purpose is, according to its statutes: 1) promoting the authentic teaching of the Church in adherence to the tenets of the Gospel; 2) the personal sanctification of its members through faithful adherence to the message of Fatima; 3) promoting the common good by spreading the message of Fatima; 4) promoting the Pledge given by each member of the WAF. The World Apostolate of Fatima has millions of members in 57 countries. You can see information about the WAF annual National Pilgrimage here, and our October Rosary campaign here. 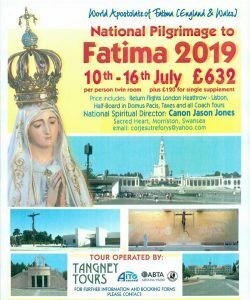 WAF England and Wales is involved in promoting the message of Fatima through Visitations to cathedrals and churches of the National PIlgrim Virgin Statue of Our Lady of Fatima and Relics of Saints Jacinta and Francisco. It also seeks to promote the daily Rosary, the Brown Scapular and the Five First Saturdays devotion, and the annual WAF National Pilgrimage to Fatima. Likewise, it seeks to promote Fatima by means of the distribution of books, booklets, literature and DVDs, and through home visitation statues, and the formation of Rosary groups. We are encouraging people to join WAF England and Wales, and are particularly looking for anyone who would like to promote the Fatima message either locally or nationally. Finally, if you are in a position to make us a donation of whatever size, that will be a real help which will be put to immediate good use, such as producing new promotional leaflets or DVDs. Thank you for your prayers and support for our work on behalf of Our Lady’s Apostolate. All the information and other photographs on our website have been compiled by, and are the copyright of, the WAF England and Wales. This material is available for anyone to use, but we ask that our website is acknowledged as the source, and that the views we present are correctly reproduced. Privacy Statement: The WAF England and Wales site will not distribute your e-mail address to any third parties, apart from the information held on the secure servers of the Mailchimp e-newsletter service.